AstroTurf Gemütlichkeit #010: Where’s the Hopsack? The local organic wholefood shop is called The Hopsack, after the loose-weave untreated fibrous material that gives the shopper a sense of the dietary worthiness within. 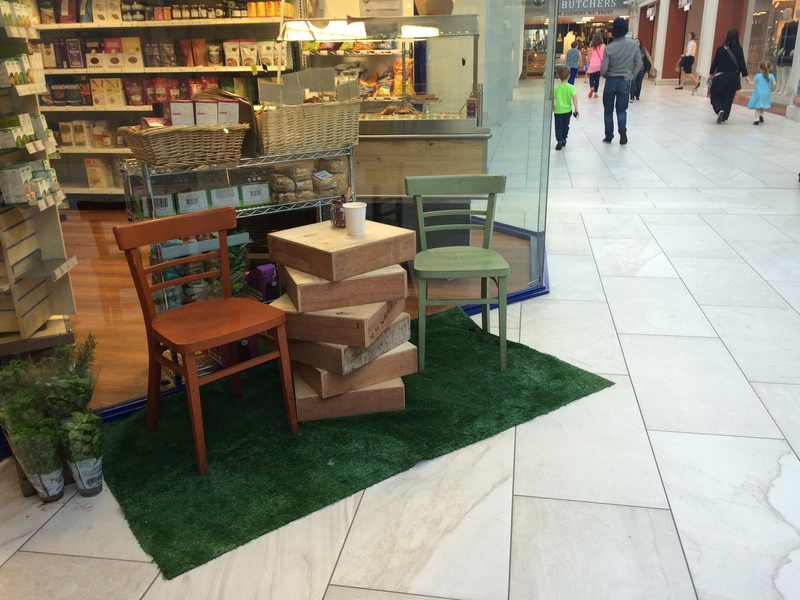 The Hopsack has temporarily relocated from another location in the same shopping mall. The new site is smaller, so the sitting-around-drinking-coffee-area has been moved to the outside. The contours of the marble tiles display a non-pattern created by the random distribution of ancient sea life, further randomized by the mining process, randomized once again by manufacturing processes of cutting, polishing and finishing, and one more time by the distribution, storage and laying of the tiles. And yet, somehow, the marble just doesn’t say ‘organic’ the way astroturf does.